In the days before public libraries, people paid for the privilege of borrowing books. But with council-run libraries experiencing a decline in users and many closing, those that require membership are seeing their numbers rise. So what exactly is the draw of the subscription library? Nestled on a high street near a charity shop, newsagent and chicken restaurant is an exclusive library that - even after 200 years - is unknown to most. Sitting behind the doors of a three-storey Grade II-listed Georgian house in Nottingham city centre are shelves and shelves stacked high with books, some dating back to the 16th Century. 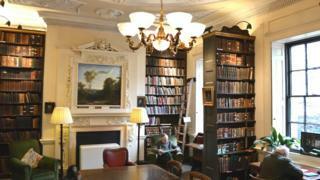 Bromley House Library has become a little haven in a busy city, but unlike most libraries, you have to pay to use it. While public libraries across the country have been closing or losing members in the past 10 years, this one has seen its user numbers double, and subscription libraries across the country are seeing a rise in popularity. It has opened its doors to the public more than ever before this year as it marks its 200th anniversary. However, as librarian Carol Barstow explains, Bromley House has always been an exclusive place. "This type of library was always for the middle classes and to join - you had to buy a share," she said. The first committee in 1816 was made up of three clergymen, a banker and two doctors with a strict set of rules and hefty fines for those who broke them. Becoming a member then would have set you back five guineas for a share (equivalent to about £550 today) and two guineas a year thereafter. Today, an annual subscription is £96, without the need to buy shares. Among its collection are rare history manuscripts and 16th Century material, as well as modern literature, travel books and biographies. Ms Barstow said: "People join because of the books, and because of the space we have. It's a place where you can be perfectly comfortable. "It is a home from home." Nygel Stevenson, who joined five years ago after he heard about the library from a friend, says he enjoys reading some of the earlier fiction that cannot be taken out of the building. "I fell in love with the place," said the 42-year-old businessman. "I joined because of the building and the history and it feels like a personal service. "What other library can you make yourself a coffee and read a book in a quiet corner? It's great. "It's like my little escape." Image caption The library has been described as a "home from home"
The London Library is one of the most well-known subscription libraries, but others include the Portico Library in Manchester, the Leeds Library and the Birmingham and Midlands Institute. While it is not clear exactly how many subscription libraries are still open in the UK - there were many more in the 19th Century but most were eventually turned into public libraries - 30 are signed up to the Association of Independent Libraries. Chairwoman Emma Marigliano said: "In today's terms we might see them as a little bit elitist. "In principle they were open to anyone and everyone, but in practice it would have been people with more money who joined. "But there has been a rise in memberships in recent years because of what is happening to libraries generally." She says most people join a subscription library for the surroundings as much as the books themselves. Often housed in grand, historical buildings, hidden among shopping areas, they offer more than just a room full of books, and members say they feel they are part of a city's heritage. "Very often people come to a building that in itself is attractive and unexpected because it is full of books. "And it is very often a joy to behold for people… and about seeing something different. "What also draws people in is the heritage and history value. "These places say something about identity and the city's identity and often it's such a shock to people that a building or library like this could be right in the city." Bromley House Library now has 1,400 members. In comparison, Nottingham's Central Library saw 462,600 visitors through its doors in 2014 and 7,000 new members joining. Across the county, 2.8m people visited Nottinghamshire's 60 libraries. While public libraries are the only option for most people, Peter Gaw, from Nottinghamshire County Council, says all libraries have the same objectives. "Libraries have gone beyond that feeling of highbrow and austere. "Bromley House is very different to our public service but they have limitations on their building about what they can do. "Ultimately, we are all concerned with the same thing and have the same aims - to get people reading and children engaging with books." Stories from the bookshelves: What does your library mean to you?